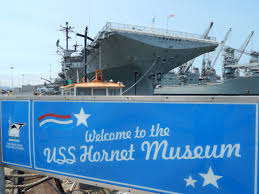 Come aboard and experience a night in the life of a sailor on a WWII aircraft carrier! where the real Hornet crew lived. Enjoy dinner and breakfast in the Crew’s Mess. Learn about this famous aircraft carrier’s daring exploits. and the historical naval aircraft on board. Learn about NASA’s Apollo 11 and Apollo 12 space missions that put the first humans on the Moon. Ride the Flight Simulator – experience what it’s like to catapult and fly from the carrier. Earn a special crew member patch & certificate!